Over the past several years, marketers have made tremendous strides with content marketing and, as a result, are communicating more effectively with their audiences. More than two-thirds of the marketing leaders interviewed as part of our executive research see their entire marketing department restructuring to address content marketing needs. But despite high adoption rates and a commitment to the discipline, not all marketers think their content efforts are as effective as they could be. To help you get the support you need, we’ve compiled a starter kit of essential talking points and support statistics you can use as the basis of your buy-in conversation. At the end, we share a buy-in process checklist you can view and print. Of course, like all statistics, the data we share here simply reflect the information at this time. Mix and match the points that are most relevant to your company’s situation, and create a library of stats that point to similar trends to help build a convincing case. Or, you can view and share the SlideShare below with the highlights. Key talking point: Let’s start by understanding what content marketing is — as well as what it isn’t. 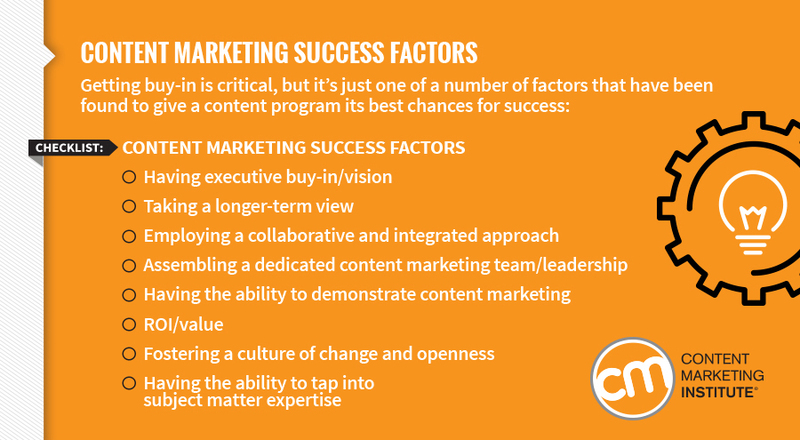 The Content Marketing Institute uses the following definition, which reflects how the discipline has evolved – from the mere creation and distribution of content to a formal business discipline. Key talking point: With content’s high adoption rates, great potential to provide measurable business benefits, and enterprise-wide appeal, a strategic content marketing program is essential to staying competitive in today’s marketplace. Sharing content has become an integral part of virtually every digital experience. Any brand not prepared to deliver quality content in a strategic way is likely operating at a significant disadvantage. Content creation and use continue to gain popularity and show no sign of slowing. Significant numbers of marketers think strategically about their use of content. Content can be used to unite and support the efforts of sales, marketing, and other departments. Key talking point: Consumers expect content that is useful, is customized to their interests, and adds value to their experiences. If we don’t provide that kind of content, they will seek out competitors that do. Content is essential to supporting loyal, trusting relationships between brands and consumers. Content dominates consumers’ online experiences. Content marketing helps create the engaging experiences that customers seek and helps develop deeper connections between brands and consumers. Content is a leading driver of brand engagement on social media and motivates consumers to take action. Content also is becoming increasingly essential for targeting younger demographics. B2B audiences have also embraced content marketing and incorporated it into their purchasing process. 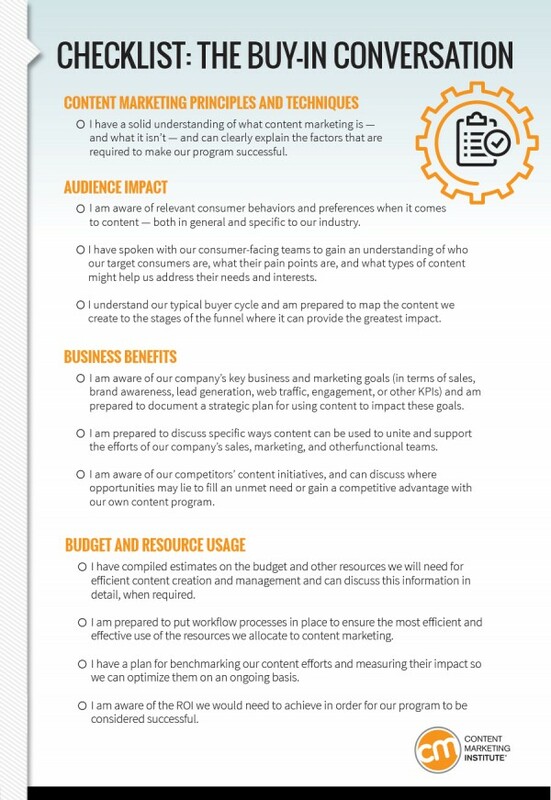 Key talking point: Companies that document a strategic content marketing program can have more effective lead generation, SEO efforts, internal teams, and processes. And, as the discipline evolves, we have an opportunity to experiment, distinguish ourselves, and help set the best practices that other businesses will follow for years to come. Content marketing is leading the pack both in lead generation and in turning those leads into customers. As search engine algorithms evolve, content marketing is increasingly becoming essential to SEO efforts. Organizations demonstrating an ongoing commitment to content marketing create team efficiencies by building staffing infrastructure, establishing quality standards, and creating processes for producing content more efficiently and effectively. The flexibility afforded by content marketing techniques such as content curation enables businesses to realize measurable results. Positive results are contributing to the growing trend of brands functioning as full-fledged publishers. Some big brands are even starting to prioritize content marketing over paid advertising initiatives. 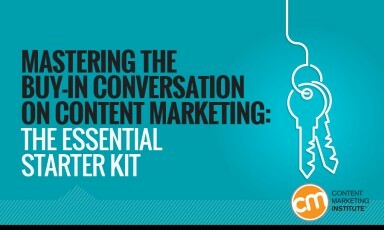 Key talking point: Content marketing can be implemented at nearly any budget point. However, allocating sufficient resources is paramount to achieving our optimal success. Our budget should identify all resources – staff, materials, and media – to create, manage, and promote content effectively. A correlation seems to exist between content marketing effectiveness and the amount of budget allocated to the discipline. Strategy also likely plays a role in budget allocations. 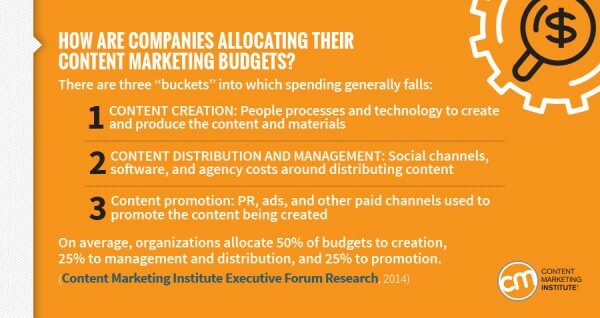 Overall, industry projections indicate strong growth in content marketing budgets. Content marketers are getting bigger budgets to produce more and better results. (eMarketer, 2014). Key talking point: Content marketing can help our organization be more proactive in how we address both consumer and business needs, and be more responsive to behavioral shifts and emerging trends. With encouraging signs of growth across the industry and bullish attitudes from marketing leaders, there’s never been a better time to enable our owned media channels to start working harder for our business with a strategic content marketing program. The future of content marketing looks bright. The industry is growing in terms of adoption, usage, and availability of resources. Marketers are adjusting their priorities to accommodate consumers’ increasing thirst for useful custom content. 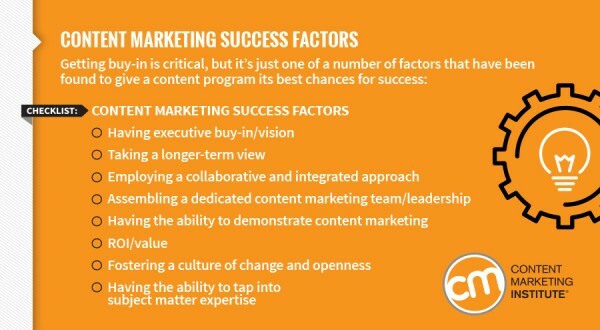 Along with the supporting reasons and data presented here, the following checklist can help you determine how prepared you are to make a compelling case and convince stakeholders that you have positioned your content marketing strategy for optimal success. Once your key stakeholders are on board, the next step is to develop and document your content marketing strategy. Download our guide, The Essentials of a Documented Content Marketing Strategy: 36 Questions to Answer, for an in-depth view of this process. Get first-hand access to more tools, techniques, and tracks to help increase your content marketing success. Sign up here to subscribe to Content Marketing Institute daily or weekly emails with exclusive content.